I now raise a native breed, the Bobwhite quail. These birds are not as hardy but they are more active and have blessed the quail sanctuary with life again. I’m amazed at their activity, it’s very entertaining. They can be found hunting, flying and sometimes just perched on a log enjoying their natural environment. I like to sit inside their home and bird watch. Learning through their instincts is amazing and has given me the opportunity to discover a great deal about both the Coturnix and Bobwhite quail. I’ve used three coop options to house my quail, one is mobile and the other two are stationary. Each one allows for interaction with the ground with suitable square footage for any backyard or homestead. Quail like their space; provide one square foot per bird, never over crowd it’s simply asking for trouble. This coop is in the bottom left photo is a 4 x 8 frame with a small shelter house inside that can also be moved. This is perfect for backyards or those who want to raise quail on a small scale. You can easily move it on fresh grass always providing a clean environment. This helps keeps costs to a minimum with the benefits of natural fertilizer feeding the grass. There are two doors to this coop allowing for easy access to add food, water and gathering eggs. This coop is in the upper left photo. It has four sections that measure 8 x 8. Each section can be blocked off with a door or remain open. I used this with the idea of rotational housing in mind. This is where you allow the quail to live in one space for a week and then move forward to clean grass area the following. This coop requires more space but offers the same benefits as the mobile coop without having to move it every week. It is also 4 ft tall which came to be difficult when entering, but if you have kids you can send them in do quail chores. For that reason we moved to the Quail Sanctuary. The Quail Sanctuary is the right photo, it was implemented from an existing structure we already had on our farm. We weren’t using it so I wired off a 60 x 12 x 6 ft. space. I completely closed this area in using chicken wire and deer netting. This happens to be my favorite housing option because the quail can live and explore without limitations. Quail love to fly and in this set up they have that opportunity to glide through the air instead of marching in a line from north to south. The thing to remember about quail is they’re natural instinct is to be on the ground, if you have the opportunity and space to raise these birds outside in a protected environment then I highly recommend one of these options. Your birds will be happier and healthier. For more on raising quail, check out Carole’s new book, Quail: Getting Started. Carole is the author of Garden Up Green, the natural home and garden. You'll learn simplistic gardening tips inherited from her Italian grandmother and building projects that compliment. Discover free range backyard birds like quail, chickens and emus, there's never a dull moment at this North Texas farm. I was thinking about putting a removable “top” on one of my 4 by 10 raised garden beds and putting quail in and rotating between my two beds every year. Can you think of any reason that this would be problematic if there is a cover so they are dry and they have a “nesting” box? Hello Carol, We have a cage on the ground and move it around and the warn weather. I live Pa. and its getting cold and I worry about keeping them warm. We have put tarps on the top and on the side that the wind hits. They have a box they can get into,but I think it needs insulated. I really worry about the snow. What do you think about them being outside in winter on the ground? IS it possible to get coturnix to regain there natural instincts? I know you have done it with the native breed but you said you start off with them. I am looking into pharoh d1 due to high egg production. also I am willing to put in a silkie to brood them if nessary. I was even thinking maybe quail raised by a chicken might teach them what they should do a little.? Where could I do more research. your the only source I can find only sorry this and your other blog. Also I do find comments here in there randomly but no hard how to stuff. I started with the Coturnix on the ground and yes they will regain their natural instincts if you begin the process from the time they’re chicks. I have a large inventory of articles on my blog, Garden Up Green. 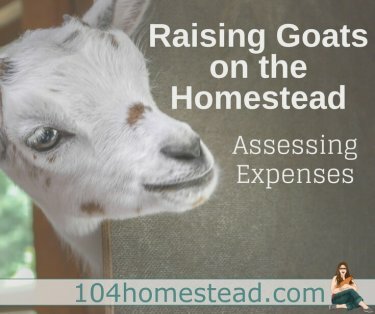 This was a guest post I wrote for 104. I’ve always raised my quail on the ground from the beginning because it appeared very unnatural to me to raise birds on wire. 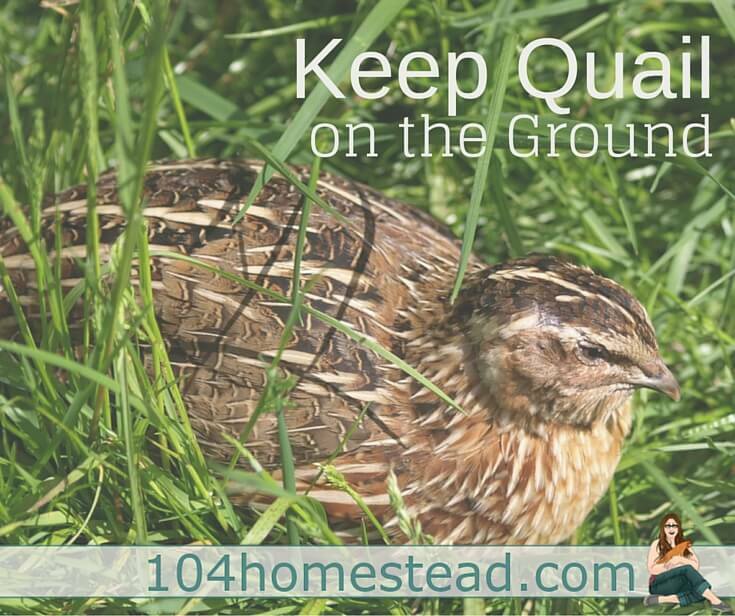 Do you have any issues with your quail getting worms due to being raised on the ground? My boyfriend and I have Texas a&m. His are in raised cages and mine are on the ground. He claims they can get roundworms if they are raised in the dirt, but they are infinitely happier when they are able to run around on the ground. What are your thoughts on this? I did have one coturnix catch an eye worm parasite. IT was contracted from crickets consumption as they (Not all) can carry this parasite. 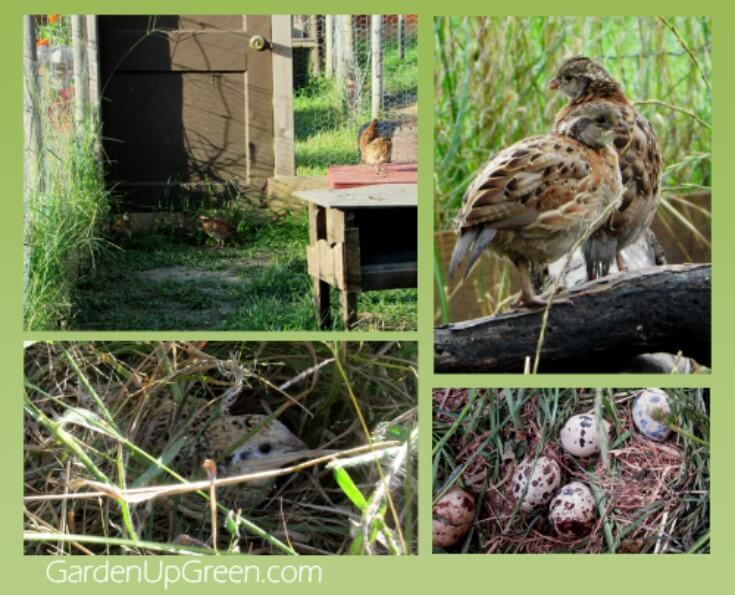 I write about quail on my blog Garden Up Green where I share my experience. I am thinking of raising quail for meat and eggs. I want them to be “free range” and would like to not give them feed. Did you need to feed them extra food or did they get enough from the grass and what ever bugs they could find. I saw in your bio that you’re in north Texas. I’m also in north Texas, in between Dallas and Ft Worth. I’m picking up my first dozen quail chicks this weekend! Do you often have chicks? Hello Carole, I like your ideas of keeping quail on the ground., I agree they are happiest on the ground and it is much gentler on their feet than wire. But how do you protect them from rats? I have not met anyone who has succeeded terribly long keeping quail on the ground (unless there is a floor), as rats can eat them alive, and in our experience they can dig under a fence in a night. It would be great if you mention how you get around this, lest people try it, the results of this mistake are devastating to experience. Thank you! Hey Vee -Here’s my question, how do quail survive in the wild from rats? I haven’t had any issues with rats in our sanctuary. It’s 60 ft long and the majority of their diet is free range. If rats are an issue for others it’s probably because they’re over feeding and rodents are seeking that feed. The other issue could be if the run is to small they have no place to escape from the rats. I also keep a clean farm with additional animals like, dogs, emus and chickens that help detour rodents. Keeping the grass low around the sanctuary is another smart thing as rodents and other pests like snakes hide in tall grass. 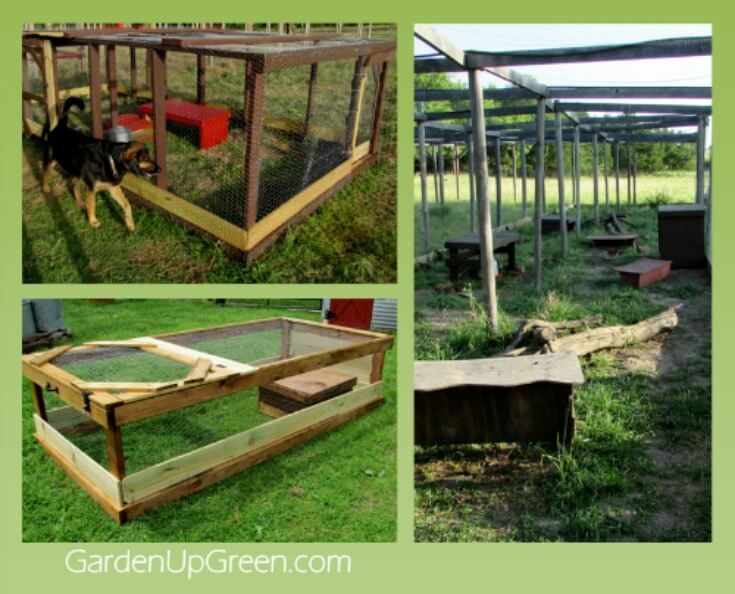 I’d like to invite you to my blog, Garden Up Green where I have many posts on raising quail including different types of on the ground housing. My wife and I are buying 20 acres of land in Virginia and want to raise ducks & quail for egg consumption ONLY. Also we would like to have a 40X20 greenhouse to grow our vegetable all year round. Can you direct me to or help me understand what we need to start learning so we can grow responsibly? Hello, this is Carole from Garden Up Green, I wrote this article. 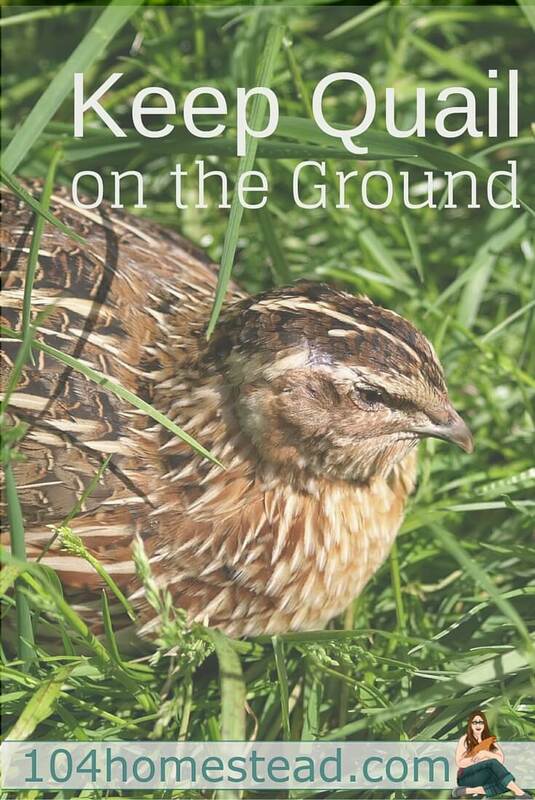 I’ve got a book- Quail Getting Started that is for beginners interested in raising quail in a natural environment. You can find it on my blog along with many post about raising quail this way. I also have a new book coming out in February that I’m really excited about related to gardening. It’s a no fail natural gardening workbook, Startle Garden. Hope that helps. I’m sure you can also find helpful information here on Jessica’s blog. Congrats on the new acreage, we recently purchased 28 and we’re turning it into a tiny house community. SO excited! !